So you are planning a game room addition and looking for some game room design ideas. A game room is a fun room to design as you can be free to be creative with your ideas. A game room, if designed right, will be a focus room for the family, so it is important that the game room address all the needs of the family, including the adults and children. When it comes to game room design, well the name says it all, “Game”, and consequently a game room commonly has a sports theme. The game room theme, however, can vary depending upon your personal sports interests. For some folks an NFL or College Football theme is what they are seeking. For others, it may be a Red Sox look. Game room design ideas do not have to be limited to just professional or collegiate sports. They can also have outdoor themes, car themes, beach themes and even casino themes. It really depends upon your family’s particular interests. Game room designs also do not need to be limited to one particular theme. Two or three themes can often be blended together, particularly if the game room is large. Pool tables and video games are also common in game rooms, as well as wet bars. In some cases, homeowners even integrate gym equipment into the game room. Game room design ideas also include use of different styles of lighting including the use of neon lighting, and sign lighting. Nostalgic sign lighting is very common to see in a game room. Game rooms typically have walls that are filled with pennants, photographs and objects that are germane to the game room theme. Usually the more wall hangings the better, as wall clutter is less of an issue in a game room. 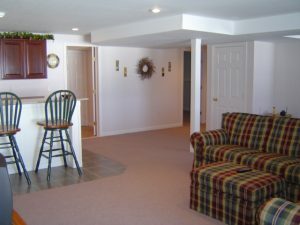 A basement is a great place to incorporate a game room. Basements typically have the living area and wall space to allow you to develop creative game room designs. An unfinished room above a garage is another great location for building a game room. So if you are thinking about a game room addition, sit the whole family down and gather some game room design ideas on themes and features that they would like to see in the game room. If done right, a game room should be fun during the planning stages as well as when it is completed. For more help on building a game room addition, see HomeAdditionPlus.com’s Home Addition Bid Sheets. Our Home Addition Bid Sheets provide you with the knowledge and information on how to plan a home building project, and what to look for when hiring contractors. They also include detailed cost breakdown tables and spreadsheets for estimating your own new home construction building costs.